As Japan’s declining birthrate has been perceived as a major menace to its society since the 1990s, pronatalist policy approaches are again a source of social and political concern. This paper focuses on a number of political measures involved in ameliorating low birthrates – measures that emphasize the necessity of educating individuals about reproduction and fertility in order to enable them to make informed decisions. Investigated will be the question of how the new trend in the narrative of countermeasures focusing on education about reproduction can be evaluated, particularly regarding the question of how the notion of “autonomy” is to be understood in this context. The reference points in this deliberation are two dimensions of autonomy that have been carved out in various fields of scholarship: (i) autonomy as empowerment and (ii) autonomy as a neoliberal government technology. Furthermore, and constituting an additional level, are the issues of how gender is depicted in this narrative, and how its representation has to be evaluated in the context of autonomy. The argumentation is based on the analysis of the political narrative on pronatalist policy, concrete examples of its implementation, as well as contributions from sources critical of the policy. Since the late 1980s, sci-fi fans and machinery aficionados in Japan have expressed their fascination with factories, projecting an imagination that sites of industrial facilities are simulacra of futuristic urban technoscape portrayed in Hollywood films. Although factory watching used to be an activity for a limited population, in the past decade organized factory night tours are becoming increasingly popular in Japan. This type of tour has expanded public interest in factories located on coastal industrial zones as a form of popular leisure-time activity. Widely known as kōjō moe (‘factory infatuation’), fans have elevated plants to objects for aesthetic appreciation. This mutation of value corresponds to an emergence of metaphysical durability of social objects as theorized by Michael Thompson’s (1979) Rubbish Theory. In the context of postwar Japan, those industrial factories have become, in Marilyn Ivy’s (1995) term, a significant form of cultural industry that complements the absence of local identity. A second driving force of kōjō moe is the contemporary digital technology that has altered the viewer’s experience of industrial factories. The circulation of digitally manipulated images provokes nostalgic sentiments and attracts the viewer to factory night tours. In the context of economic demise and gradual transition to postindustrial society, industrial factories represent the previous age of material grandeur. Alongside, kōjō moe has set forth longlasting artistic values of them as cultural capital. Children with disabilities in the Japanese school system: a path toward social integration? Japanese children with disabilities have traditionally been educated in special schools, specifically dedicated to one type of disability, and often isolated from the rest of society. However, in 2006, in the course of the general reform of education, special education was reformed to promote the principle of “inclusive education” – that is, education in mainstream schools along with non-disabled peers – and, in a broader sense, education meeting the needs of all children, regardless of their particularities in terms of abilities, command of the Japanese language, ethnic/social/family background, etc. This paper aims at assessing the results of this reform after almost ten years of implementation. To what extent has the 2006 reform contributed to improving the integration of disabled or less-abled children into Japanese society? Based on quantitative and qualitative data, the argument shows that it has achieved mixed results in practice, with large variations depending on the type of disability considered. The observed evolution can be interpreted as an extended individualization of pedagogy in mainstream schools, still enrooted in the framework of strong control processes. Even though new structures are created in order to meet everyone’s needs, the implemented approach remains based on a willingness to externalize difficulties, rather than the promised radical transformation of schools toward the recognition of a general diversity. Questions of continuity and transmission, as well as relationship to the community, have long occupied an important part of folk performance scholarship. These topics take on a different urgency in disaster-affected communities, where preexisting socioeconomic issues become more pressing and endanger not only the continuity of folk practices but the communities themselves. The aftermath of the 2011 Great East Japan Earthquake and tsunami has seen a surge of folk performance revivals in affected areas, hinting to the depth of the ties between local folk performance and community. 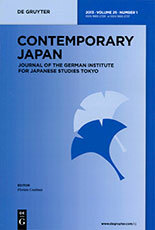 Following an ethnographic approach, this paper explores the case of the community of Ogatsu (Ishinomaki City, Miyagi Prefecture) and its folk performance, the Ogatsu hōin kagura, as one expression of the revival process in an isolated, rural community extensively affected by the 2011 disaster. Putting in perspective the underlying dynamic of continuity and change that characterizes folk performances, the objective is to explore the nature and usage of the kagura and its relationship to the post-disaster community as it responds to changing circumstances. This paper examines the attempts of Japanese business groups to destabilize the discursive hegemony of Japanese-style management and replace it with a new neoliberal order advantageous to management interests. Japanese-style management (Nihon-teki keiei) can be seen as a key element of Japanese social identity, which interpellates both workers and management into performing particular institutional practices. Altering these practices requires not only deregulatory reforms to the labor market but also a powerful discursive intervention to undermine and replace sedimented positions. Through an analysis of public policy documents, this paper shows how Japanese business groups have been carrying out such an intervention through the articulation of two keywords – “diversity” (tayōsei) and “independent-style employee” (jiritsu- gata jinzai) – which are used ambiguously to structure a controversial deregulatory agenda into existing discourses of globalization, creativity and social values.